Skincare and beauty experts are constantly on the hunt for new ingredients to help our skin glow, look healthy, stay young, and keep clear. Natural ingredients are even better - when you think about eating, you don't really want to eat synthetic food so what's the difference between letting chemicals sink into your skin and enter your body? More beauty and skincare companies are turning to natural ingredients purely because us consumers are making the decision to be more conscious. And even more brands stopped testing on animals because it's just awful and should never be done, but also because consumers have chosen brands which are animal friendly. So don't ever think your purchase won't make a difference when it comes to supporting our furry friends! When I first heard about seahorse plankton, though a press release for the lovely product which I will eventually talk about, I was really intrigued because I have literally never heard of it before. Seahorse Plankton is actually Plankton micro algae which is common in the diet of seahorses - so don't worry, we're not actually deriving anything from the seahorses themselves. Seahorse plankton is packed with Omega fatty acids, vitamins and antioxidants which increase collagen production by just under 20% in 24 hours! This makes your skin plumper, firmer, and more radiant with a healthy glow. Beauty Kitchen is a natural skincare brand which doesn't test on animals - immediately a brand that goes to the top of my skincare list, and I'm sure you will appreciate this too. They did some research and found out all about the magical beauty ingredient, but they also did some research on the natural world around it. Did you know there are around 54 species of seahorse around the world and most of them are considered endangered? 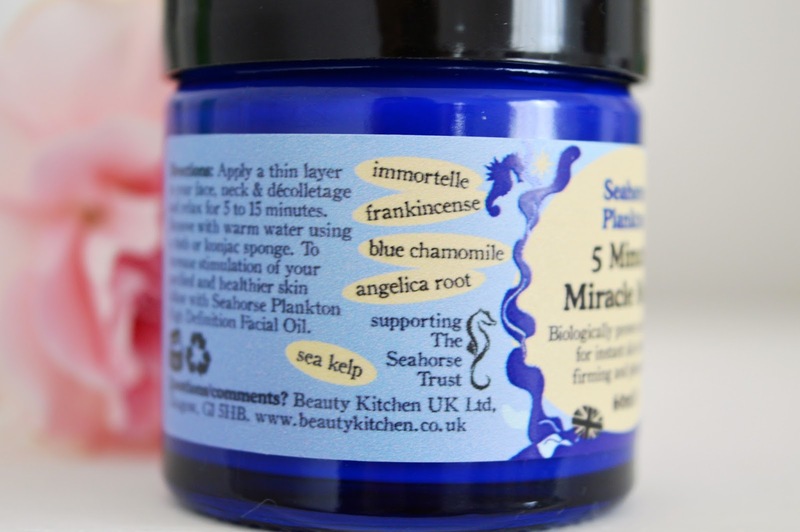 So Beauty Kitchen decided that they would help - and are now supporting The Seahorse Trust, and always make sure their ingredients are sustainably sourced. 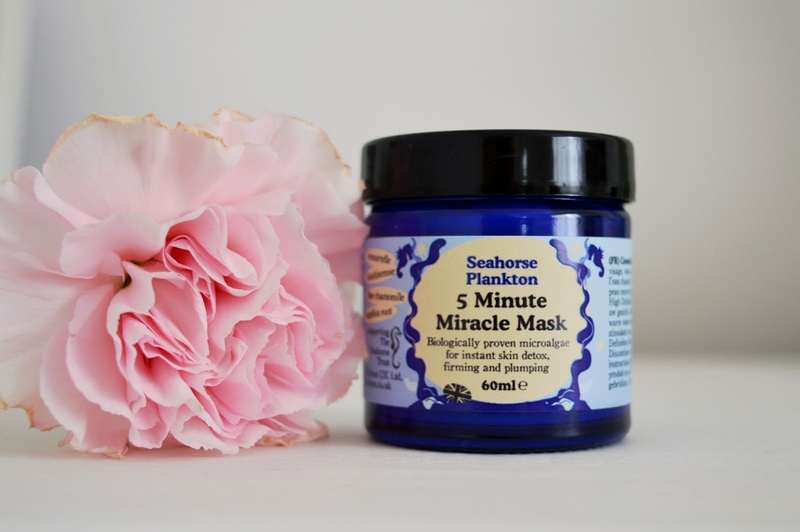 So with all this magical information in mind, Beauty Kitchen decided to take this beauty miracle ingredient and create a range of products - one of which is a Seahorse Plankton 5 Minute Miracle Mask. This mask is 100% natural and detoxes, stimulates, and plumps your face, neck and décolletage. You're supposed to be left with a healthy, firm skin that has a fresh glow. But does this miracle mask really work? 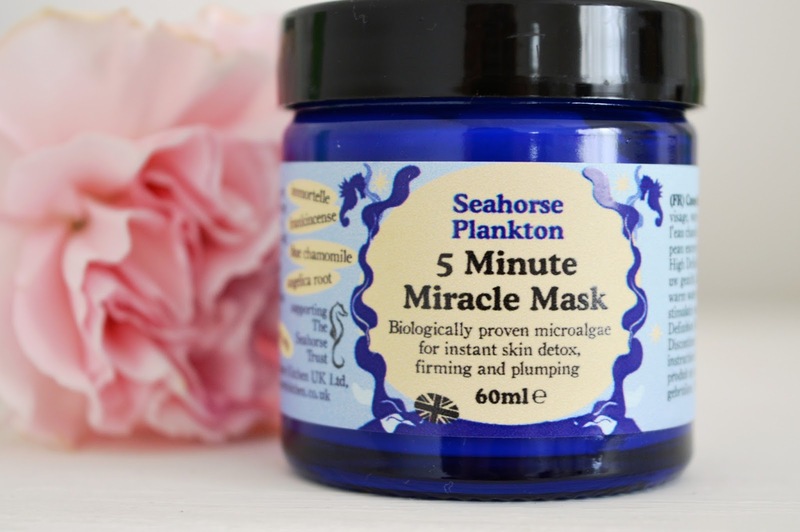 I trialled the Seahorse Plankton 5 Minute Miracle Mask to gather results for you: you apply a thin layer of the mask to your face, neck and décolletage and relax for 5 to 15 minutes. So I guess this product should really be titles the 5-15 Minutes Miracle Mask! I find the results are best if you keep it on for the 15 minutes, it allows the product to really sink into your skin. It smells really nice too, and I love to keep it on my skin whilst I'm relaxing in the bath - a truly pampering experience. You then remove the mask with a cloth or konjac sponge (I used a cloth) and warm water - then finish with your moisturiser or facial oil. I actually loved how this mask made my skin feel - so soft and super smooth. Even when I applied moisturiser the next day in the morning, it felt really nice and smooth. I use this mask once or twice a week to keep skin glowing and firm and I would happily recommend the product to all of you. Have you heard of Seahorse Plankton before? Would you give this product a go?